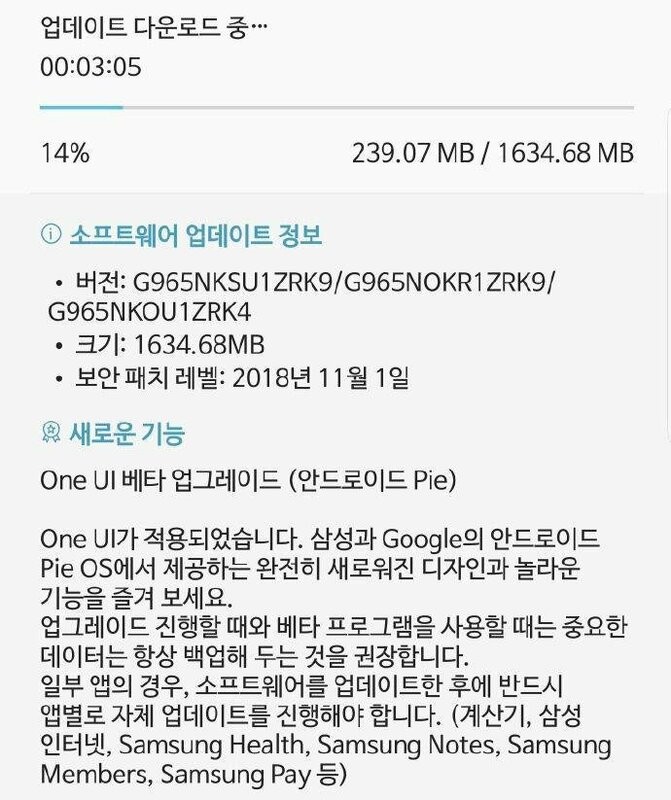 Galaxy S9 One UI (Android Pie) beta program now live! The day you have been waiting for is finally here. The Galaxy S9 Android Pie beta program has been launched today. Available for the Galaxy S9 and Galaxy S9+, the beta program will give you the chance to test Samsung’s new user interface, dubbed One UI, along with the latest version of Android. The program is live in South Korea at the moment but will also be available in Germany and the US. You can register for the beta in the Samsung Members app (Samsung+ for folks in the US). Just open the app, tap the Notices button, and you should see an option about enrolling into the beta program. Once enrolled, you will be able to download the Android Pie beta build from the Settings » Software update menu by tapping Download updates manually. You will need a Samsung account to do this, as expected. Don’t fret if you don’t see a notice about the program in Samsung Members just yet. It may take some time to become active for everyone, although you’d want to be as quick as possible with registering as there are going to be limited slots. It’s also a good idea to back your data up through Samsung Smart Switch before installing the beta. We will be testing Android Pie out on our Galaxy S9 to see what’s new and what’s changed. You can check out our hands-on experience with One UI on the Galaxy S9 in the meantime and can also look forward to further coverage on Android Pie for all the nitty-gritty details. Any news about UK beta program? i dont think it will be this month …maybe december 3rd/4th? What about Germany beta program? any news?!! Will the beta update erase the user data or will be like normal OTA? Installing it now. Sprint S9+, signed up maybe 30-45 minutes ago. I needed to side load 11.2 version of Samsung+ to see the sign up. Just to ad, I’m on the sprint network as well. In US.. S9+ on Sprint.. already downloaded and installing now. I went to PlayStore and forced updates. Received new version of Samsung app. Opened and signed up for beta. Took a couple minutes but it showed up as an update after I manually checked a couple times. How do you force an update. Any one state side received it yet? Come on US! Hopefully it will pop up soon for us here. The tittle is pretty deceiving, it’s not live only in Korea, not anywhere else, there should be updated towards this article to reflect actual ability as it actually becomes available, also for people using the Samsung+ app and not the Samsung members app there’s NO “notices” tab anywhere, it doesn’t exist, it’s called notifications not notices. Am i missing something, or is it really removed from current version? I downloaded it, too. It’s just a beta, so I’m sure they just haven’t added the feature, yet. I’m pretty you can count on it being available in the official release. First it’s a sideload so there might be some parameters that will not work until your software version is 9.0, I’ll suggest ones the beta is live at your location, to check if this features come back, it could be that they have been removed, no way to know until the final version of the is actually out in the wild. I know, I been checking since the article went up, nothing, last year the US got it pretty late, I think it was around 1 or so, let’s hope we do get it today and it’s not just live in Korea. The Beta is only for the S9’s, however, the official launch for S9’s and Note9 is in January. Any tips how to participate from a Country not supports beta Program? Downloaded Samsung Members on my S9+ but nothing in notices to enroll. The article it’s pretty vague, it seems like it’s only live in Korea not anywhere else, they should clarify that so we actually have a better idea of when it will be. How long do these beta tests usually take to reach Australia?